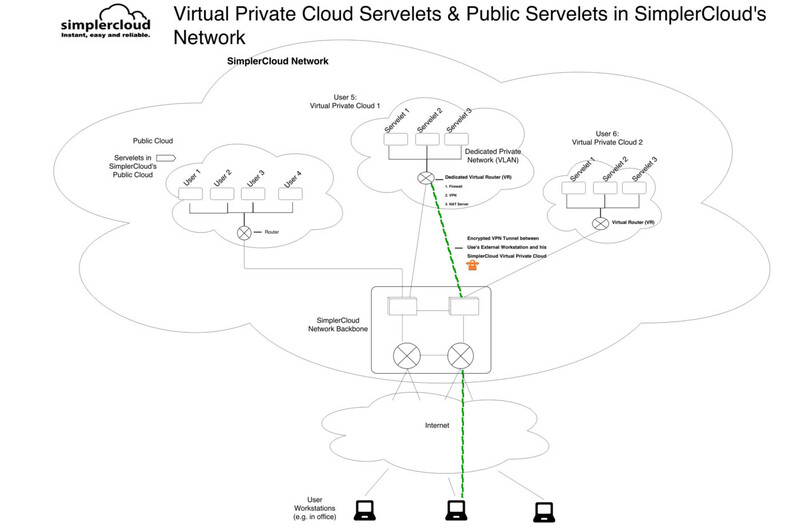 We have been working very hard on this new service and are very pleased to introduce Virtual Private Cloud (VPC), a new service that allows our customers to launch and run one or multiple servelets on a dedicated private network or VLAN, keeping it seperate from other servelets on the public network. Within this VPC, customers may also configure advanced hosting features like VPNs, firewalls, and set up load balancing. Our Virtual Private Cloud service allows customers to provision servers in an isolated sector of the SimplerCloud network, creating a private “virtual network” or “virtual private” cloud within which other related services such as firewall, load balancing and VPN can also be self-provisioned. VPC users are assigned one or multiple public IPs, and all servelets are allocated private addresses behind a virtual router (VR) that will act as the Network Address Translation (NAT) device to translate and map the public IP addresses installed on the VR to the private IP addresses installed on the servelets. From the VPC panel, users have full control over their virtual networking environment and can perform a variety of functions, including configuration of ingress/egress firewall and port forwarding. Because a virtual router is included, additional functions such as as server load balancing, create and manage VPN accounts are all possible. Like all our servelets, the Virtual Private Cloud is self-manageable and there is comprehensive guidance on how to manage various aspects of the Virtual Private Cloud – here are some articles from our knowledge base. We also provide a Virtual Private Server configuration & maintenance service that will cover configuration, advisories and trouble-shooting on an ad-hoc or monthly basis. Please see our Virtual Private Cloud web page for more details. What can Virtual Private Cloud be used for? Here are a number of scenarios in which Virtual Private Cloud can be used. Users can have launch servelets in a private subnet behind a firewall, and then map their public IPs only to their public-facing servers such as web servers and mail servers. Backend services such as database servers and other applications servers which do not require public-facing interfaces can stay within the private subnet without any public IP mapping, enhancing security for those backend servers. However, outgoing firewall rules can still be configured to allow those backend servers to access the Internet via NAT to download patches, for example. Certain applications, such as Microsoft Network’s Active Directory, need a private network since they cannot run on a public network that is shared with other customers. With SimplerCloud’s VPC, users can deploy Windows servelets, including Active Directory servers, to run within a private network separated from other customers’ network. They can then leverage network access control lists in forms of inbound and outbound firewall security rules to open certain ports required by the running applications. With the Virtual Private Network capability that comes with VPC, users can have secured, encrypted connections from their off-site workstations into the VPC. Through the VPN gateway, they can access their servelets using their private IP addresses, so it seems that their workstations are on the same private network as the servelets. Users will be able to access all the applications on the cloud as if they are within their own private corporate network. You can have two or more servelets running common services such as web services, and then load balance them. You can then easily scale your web services and add more servelets into the load balancing cluster, as and when it’s necessary. You just need to configure one public IP on your VPC to be mapped to the services. You can also select the algorithm you want to use for the load balancing (whether it’s round-robin, least connections or source), and optionally you can configure stickiness and health check settings as well. Please read more about VPC services,including prices and how to order this , at our Virtual Private Cloud web page. You can also tell us about your custom cloud needs and ask for a free consultation. This entry was posted in Managed Services, New, Servelets and tagged firewalls, load balancing, VPN. Bookmark the permalink.